This recipe, as with most of my favorite recipes of late, began with a trip to the shuk. It may be February, but springtime is in bloom, and the artichokes at the market were stunning (apparently they come to Italy in late February). With no particular plan in mind I bought four. You should know that I have a bit of a rocky history with artichokes, particularly an unusually thorny one that left me the worse for wear early in my cooking career. 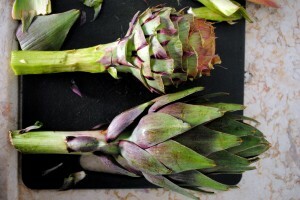 Artichokes can be intimidating – those tough outer leaves, the necessary trimming, the quick discoloration. But once you learn to properly turn and prepare an artichoke, the result is always satisfying. The simplest preparation for artichokes is to lightly steam them and drizzle them with olive oil, melted butter, and/or some lemon juice. Making them alla Romana requires little extra work or time. Trim the artichokes as normal but then put them directly in a pot just large enough to hold them and add garlic, butter, olive oil, parsley, lemon juice, white wine, and stock. 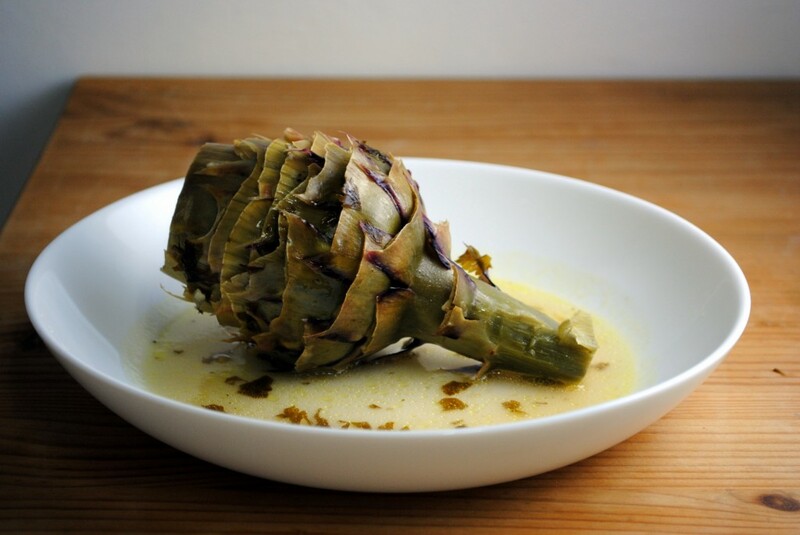 After they’ve simmered, covered, for about half an hour the entire artichoke, including the stem, is tender enough to eat and has absorbed all the delicious flavor from the simmering liquid. It is absolutely divine. Great as a starter, side dish, or even a meal all its own, this recipe is almost fool proof. To use the leftover artichokes (two is plenty for two people as a side) I removed the leaves, breaded and fried them, and served them with homemade mayo (a recipe I’ll share shortly). Incredible. What are you waiting for? Mangia! 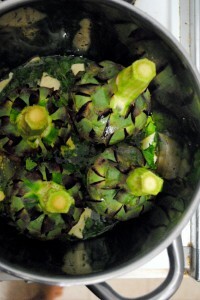 Turn artichokes: Pull back an outer leaf until it naturally cracks and, using a sharp paring knife, cut at this point. Continue doing this to all the outer leaves, turning as you go, until you get almost to the middle. Slice off the entire top third of the artichoke. Peel the stem and immediately put the artichoke in a big bowl of water with a bit of lemon juice to prevent discoloration. Repeat with the remaining three artichokes. Put the artichokes in a pot large enough to hold them and put a lid on, but small enough that they are close together and able to stand. Add the remaining ingredients. Bring to a boil, reduce heat to medium-low, and cover and simmer for 30 minutes, or until artichokes are tender. Serve whole as a side dish (I had it as an accompaniment to Risotto alla Milanese with grilled chicken) or in a bowl with some of the broth and crusty bread as a starter. i always skip the trimming… i’ve never understood the pt– just don’t eat the ends! i prepare similar to you– no wine, water instead of stock and then dip in mayo mixed w/ vinegar– red wine or balsamic. yummm. Oooh yum! Next time I’ll try not trimming them. I guess it depends if you want to do the work before or at the table. I want to eat fried artichoke leaves in mayo all the time.